Tibial plateau fractures are complex injuries of the knee. The tibial plateau is one of the most critical load-bearing areas in the human body. Early detection and appropriate treatment of these fractures are essential in minimizing patient's disability in range of movement, stability and reducing the risk of documented complications. A type I fracture is a wedge-shaped pure cleavage fracture of the lateral tibial plateau, with a displacement or depression less than 4mm. They are caused by the lateral femoral condyle being driven into the articular surface of the tibial plateau. Type II is a fracture with a combined cleavage and compression of the lateral tibial plateau, a type I fracture with a depressed component. There is a depression greater than 4mm. A Schatzker type III fracture is a pure compression fracture of the lateral tibial plateau in which the articular surface of the tibial plateau is depressed and driven into the lateral tibial metaphysis by axial forces. Type III fractures are divided into two subgroups: those with lateral depression (type IIIA) and those with central depression (type IIIB). Type IV is a medial tibial plateau fracture with a split or depressed component. These fractures occur as a result of varus forces combined with axial loading in a hyperflexed knee. Type IV fractures have the worst prognosis. Type V fracture consists of a wedge fracture of the medial and lateral tibial plateau, often with an inverted “Y” appearance. Articular depression is typically seen in the lateral plateau and might be associated with a fracture of the intercondylar eminence. The first three types are mostly the result of low energy injury, the three others of high energy injury. The magnitude of the force determined the degree of fragmentation and the degree of displacement. The proximal end of the tibia terminates in a broad, flat region called the tibial plateau.The intercondylar eminence runs down the midline of the plateau, seperating the medial and lateral condyles of the tibia. The two condyles form a flat, broad surface for articulation with medial and lateral condyles of the femur. Soft tissues of the knee can also be effected in tibial plateau fractures see knee for more details. Tibial plateau fractures are typically caused by a strong force on the lower leg with the leg in varus or valgus position, or simultaneous vertical stress and flexion of the knee. Commonly seen in road traffic accidents, sports accidents with a high velocity such as skiing, horse riding and certain water sports. Due to the nature of injury soft tissue trauma is likely such as ligament rupture and needs to be considered when managing. Tibial plateau fractures are common intra-atricular injury for which CT-scans are routinely used for pre-operative planning to rule out other pathology. Approximately 50% of the knees with closed tibial plateau fractures have injuries of the menisci and cruciate ligaments that usually require surgical repair. Radiographic evaluation of these fractures involves four views: anteroposterior, lateral, internal oblique and external oblique. Computed tomography (CT) is of great value for determining the location and magnitude of the joint depression, however MRI has been shown to classify and assist management of the fracture best. Between Schatzker I and II there is not a clear visible difference on X ray. Since the tibial plateau involves a major weight bearing joint, the outcome is tied significantly to the resultant alignment and articular congruity after fracture healing with or without surgical intervention. If the joint is stable with good alignment, articular congruity and no loss of joint motion, good results can be expected. If infection, nonunion, cartilage injury or associated soft tissue injuries are not addressed, the functional outcome for the patient will be lower. It has been reported that higher Schatzker valued fracture produce poorer outcomes due to the extent of trauma along with soft tissue damage is likely. There has yet to be a gold standard for accurately predicting the presence of soft tissue injuries in tibial plateau fractures. However, there have been recent studies that have employed preoperative magnetic resonance imaging (MRI) or operative arthroscopy to evaluate the extent of tissue damage. For tibial plateau fractures, preoperative planning is fundamental. The clinical history, trauma mechanism, age and associated co-morbidities influence the treatment decisions. In the physical examination, the soft-tissues, neuro-vascular function and associated skin lesions should be assessed so that the intervention will be appropriate, depending on the extent of the potential trauma. Management of these fractures consists of using comprehensive classification systems that are easily reproducible and have valid prognostic value, thereby making it conceptually easier to define tactics and surgical accesses. The primary aim for orthopaedic management is to restore the congruence of the articular surface and ensure mechanical axis alignment. Any deviations from anatomical condylar position or ligamentous instabilities may lead to an increased likelihood of degenerative osteoarthritis and subsequent reduced functional abilities. Commonly managed by Open Reduction and Internal Fixation (ORIF). 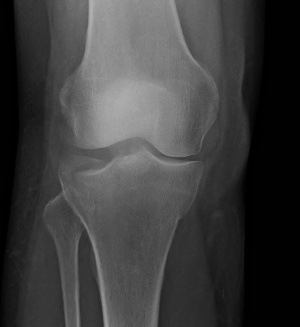 Post tibial plateau fracture osteoarthritis is common (approximately one third of all tibial plateau fractures) due to the articular surface being involved, despite the age of the patient at the time of fracture. After a fracture, physical therapy may be required to help ensure return to optimum function as quickly as possible. The patient's goals and psychological state must be considered to reduce the risk of persistent pain following surgery. Tibial plateau fractures are notoriously difficult to manage, particularly when there is a medial or posteromedial component. The treatment for tibial plateau fractures aims to achieve anatomical reduction of the joint surface and stable osteosynthesis in order to enable early mobilization, so as to prevent complications such as joint stiffness and general post operative complications such as deep vein thrombosis or pulmonary embolism. Physical therapy protocol varies depending on surgeon preference and there appears to be no set protocol for length of time spent non-weight baring (NWB). The below is a guideline please consult operating surgeon prior to starting physical therapy post-operatively. This stage can vary depending on extent of trauma from four weeks to eight weeks. Often immobilised in a cricket pad splint or "Genu-range" style brace locked in full extension. At this stage static quadriceps and passive knee ROM can be started depending on guidance from surgeon. Continuous passive movement machine can be used. Focus on analgesia and swelling reduction. Residual joint ROM exercises i.e. hip and ankle. Gradually increase weight baring on operated leg aiming for fully weight baring by 12 weeks depending on level of pain. Return to normal activities of daily living. Strengthening exercises should be encouraged in long term management due to the high prevalence of knee osteoarthritis following tibial plateau fracture. See Resources for some examples of rehabilitation protocols (independent physical therapists USA and UK). Tibial plateau fractures do not occur frequently. These fractures are typically caused by high energy trauma, but they can also occur due low energy trauma (e.g. slip and fall). Physical therapy is very important, but depends on the patient and cause of fracture. Initial presentation will be oedema, pain, loss of ROM, strength and function. Post-operatively, early ROM and mobility is important. In the sub-acute stages pain, oedema, and ROM must be managed but this will vary depending on surgeon guidance. In the later stages strength, proprioception and restoring normal function are paramount. ↑ 2.0 2.1 2.2 Papagelopoulos PJ, Partsinevelos AA, Themistocleous GS, Mavrogenis AF, Korres DS, Soucacos PN. Complications after tibia plateau fracture surgery. Injury. 2006 Jun 1;37(6):475-84. ↑ 6.0 6.1 Dendrinos GK, Kontos S, Katsenis D, Dalas A. Treatment of high-energy tibial plateau fractures by the Ilizarov circular fixator. The Journal of bone and joint surgery. British volume. 1996 Sep;78(5):710-7. ↑ 7.0 7.1 Agnew SG. Tibial plateau fractures. Operative techniques in orthopaedics. 1999 Jul 1;9(3):197-205. ↑ Andrew Dodd, Elizabeth Oddone Paolucci, and Robert Korley. The effect of three-dimensional computed tomography reconstructions on preoperative planning of tibial plateau fractures: a case–control series. BMC Musculoskelet Disord. 2015; 16: 144. ↑ 10.0 10.1 Yacoubian SV, Nevins RT, Sallis JG, Potter HG, Lorich DG. Impact of MRI on treatment plan and fracture classification of tibial plateau fractures. Journal of orthopaedic trauma. 2002 Oct 1;16(9):632-7. ↑ Barei DP, Nork SE, Mills WJ, Coles CP, Henley MB, Benirschke SK. Functional outcomes of severe bicondylar tibial plateau fractures treated with dual incisions and medial and lateral plates. JBJS. 2006 Aug 1;88(8):1713-21. ↑ 12.0 12.1 Tscherne H, Lobenhoffer P. Tibial plateau fractures. Management and expected results. Clinical orthopaedics and related research. 1993 Jul(292):87-100. ↑ 14.0 14.1 Rademakers MV, Kerkhoffs GM, Sierevelt IN, Raaymakers EL, Marti RK. Operative treatment of 109 tibial plateau fractures: five-to 27-year follow-up results. Journal of orthopaedic trauma. 2007 Jan 1;21(1):5-10. ↑ Castillo RC, MacKenzie EJ, Wegener ST, Bosse MJ, LEAP Study Group. Prevalence of chronic pain seven years following limb threatening lower extremity trauma. Pain. 2006 Oct 1;124(3):321-9. ↑ Biyani A, Reddy NS, Chaudhury J, Simison AJ, Klenerman L. The results of surgical management of displaced tibial plateau fractures in the elderly. Injury. 1995 Jun 1;26(5):291-7.